A landscape canvas print is a stylish alternative to traditional framing for any landscape photography or artwork. Capture the attention of an audience in a gallery or add some extra style to your home with your own landscape canvas. Use your own design or get creative with collage and text options in our online studio. Display your work on landscape canvas prints to create an impact in any room. The design possibilities are endless; whether you want to showcase your photography, create a collage of family photos, or design a unique gift for a loved one. Your images will be reproduced using a superior printing process to give you a vibrant and sharp image with a consistent, even tone. The canvas has a lightly textured grain and a contemporary matte finish, with no plastic coating on top. Your landscape canvas will be stretched over handmade pinewood frames that won’t crack or warp over time, and are ethically sourced. We’re so confident in the quality of our prints, that we offer a lifetime guarantee with every order. It’s simple to design landscape canvas prints in our online studio, where you can arrange your image and get creative with templates, text, and various wrap options. Create a statement with large scale landscape canvas prints in sizes up to 200 cm x 150 cm. 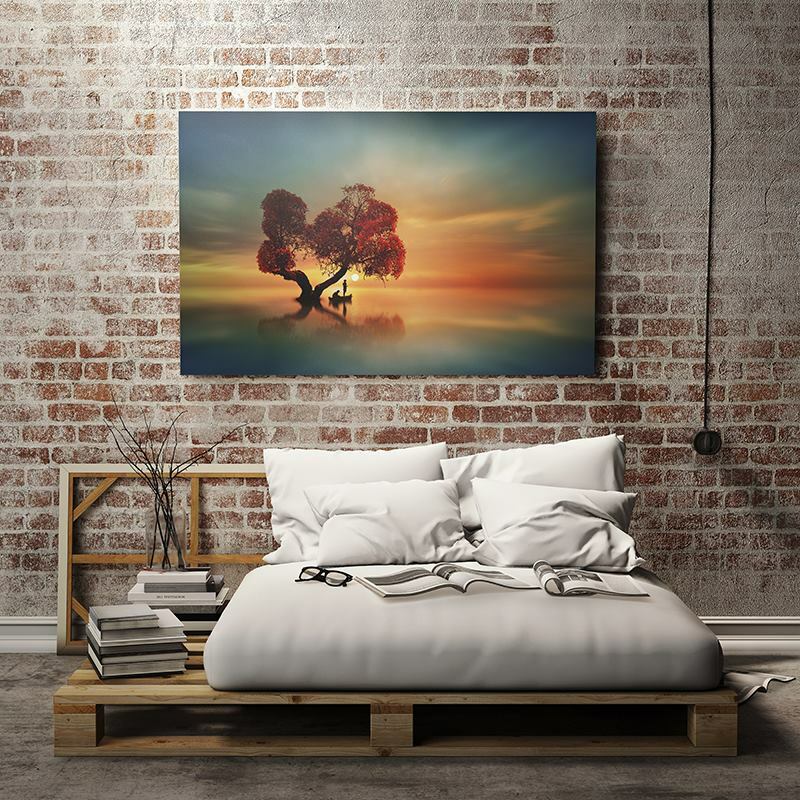 If you’d rather share your work on a smaller scale, we offer landscape canvases in sizes starting from 30 cm x 30 cm, which are perfect for smaller wall spaces or gifts. Choose from two depths; 2.5 cm for a standard finish, or 4.5 cm for a sturdier frame that stands out against a wall. Choose 4.5 cm for prints 150 cm plus to give them extra support. Your image will be printed on 100% poly genuine woven canvas, allowing for a durable material with a slight grain texture which will remain strong over time. Both flexible and sturdy, this material is the ideal choice for a gallery quality canvas. Your landscape canvas prints will be displayed on a frame hand-crafted by our makers onsite in the UK. Every frame is created from sustainably sourced pinewood bars, which won’t split or warp. Precisely cut frames mean your landscape canvas prints will have a gallery quality finish and display your work to the highest possible quality. 8 stretcher bar wedges are used as opposed to the traditional 4 to ensure the perfect tension. Although your canvas will be hand-stretched, the tension may loosen over time and the extra wedges will allow you to effectively adjust your canvas if this occurs. Sublimation printing uses heat and pressure to lock the printing dyes directly into the fabric fibres, ensuring they won’t budge. The result is a canvas print which is washable, robust and scratch proof without a plastic coating on top. Expect vibrant colours, a consistent, even tone and beautifully sharp images. Just like our FSC certified frames, we take an eco-friendly approach to our printing. Environmentally friendly inks will give you peace of mind, as well as creating a stunning print. To preserve the colours, please keep your canvas out of direct sunlight. You can choose from a variety of wrap options – the wrap is what fills the edges of your landscape canvas. Select your wrap option when you click “Start Design”. For a more contemporary look, choose the gallery wrap where the image will continue over the canvas edges or a mirror wrap where the image is reflected over the edges. It’s important not to lose elements of your photos when choosing the wrap, so check our design tips below to pick the perfect wrap for your design. It’s simple to hang your landscape canvas with our free wall hanging kit which will come with your order. Affix the picture hook to the back of the canvas frame and hang it anywhere you like. The wall-hanging kit also comes with screws and wall-plugs. It’s essential to choose a wrap option which will make sure no important details of your landscape canvas prints image are lost and to enhance the design. When details such as faces are near the edge of the canvas a colour wrap is more suited. If you want your canvas edges to be coloured, choose the coloured wrap option and select your colour choice. To ensure you don’t lose any important parts of your design, make sure you don’t fill the bleed area with any important details of your photo. The bleed area is the leeway we use for creating a print. You should fill this area with your image as it could be visible on your final canvas, but it may be cut off so don’t leave any important parts in this area. 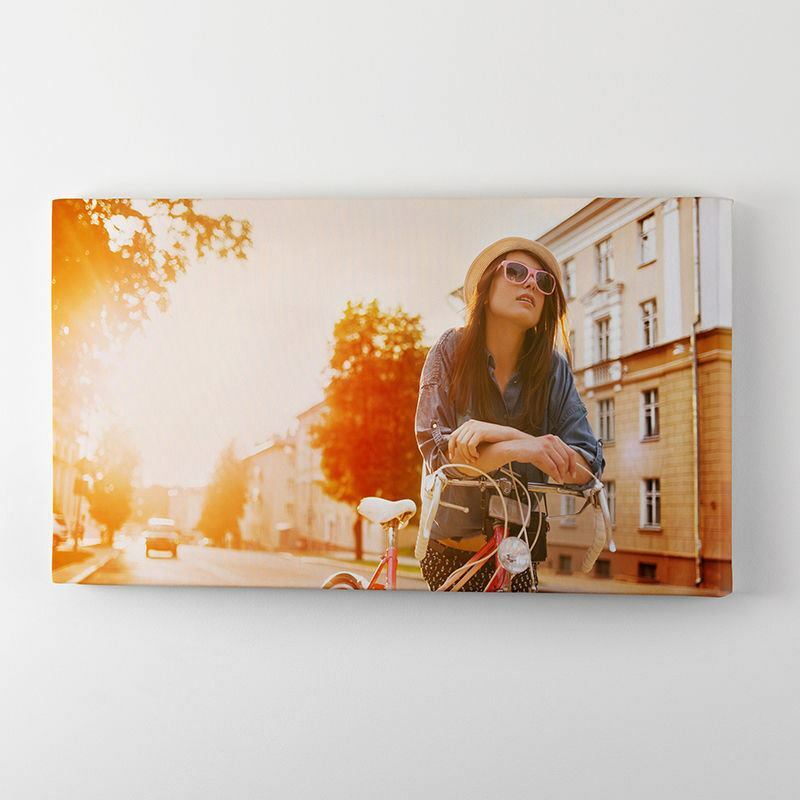 Cityscape or travel photography looks striking when printed on a landscape canvas. Sprawling scenery shots can become a focal point for the room and draw a viewer in. Try creating a black and white landscape print of holiday scenery for a dramatic look. Landscape canvases look beautiful when displaying artwork in an exhibition, particularly large-scale sizes. Alternatively, try displaying two landscape canvases one above the other for a series of artworks on smaller wall space. Our online design tool gives you the option to create photo montages using templates or by designing it yourself. Add multiple photos to produce unique collages, and even add creative elements such as a message. Why not try arranging your images in a shape on top of a blurred background for a stylish frame effect?